We've been home from our Carribbean cruise now for just over a week but sometimes it feels a bit like it was all a dream. Luckily pictures like this one of Mr K on the beach remind me of what a great time we had. 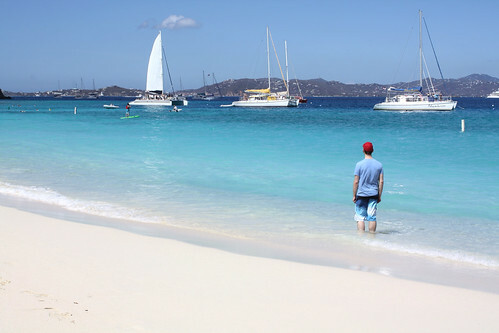 When we first booked our trip, this beach in St John, US Virgin Islands was all I could think about. A white sand beach, clear turquoise water, a floppy hat and a swim suit. 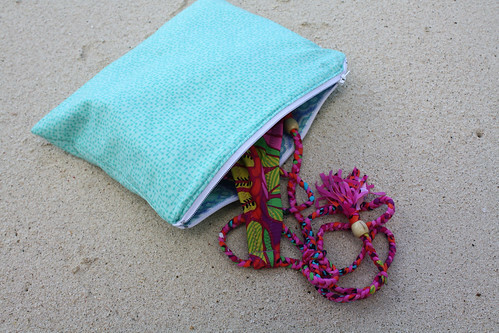 With this vision in my mind, it didn't take me long to cut into some laminated cotton to whip up the perfect bikini beach pouch. There are few things more annoying at the beach than having to make the decision to either wear a wet bathing suit around all day, or alternatively getting your entire beach bag contents wet because you decided to take it off. To solve this inconvenience, I made a simple pouch and lined it with laminated cotton. 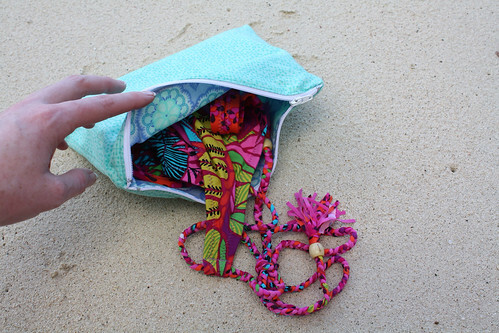 For the outside of the bikini bag I used an aqua coloured print by Apple Jack by Tim and Beck for Moda. For the lining I chose Honey Violet Mosaic from Honey Honey by Kate Spain. This was a quick project that made the beach extra enjoyable. Don't you love when simple things have the power to make your day? Now if only the snow in Canada would melt and bring on summer so I can put this little pouch to more good use. In the meantime I'm headed straight for cover under a warm quilt to wait it out.